2012 marked the semi-centennial of the Colorado Springs Coin Club. Our club was established in 1962 and has promoted numismatics in the Pikes Peak region since its inception. 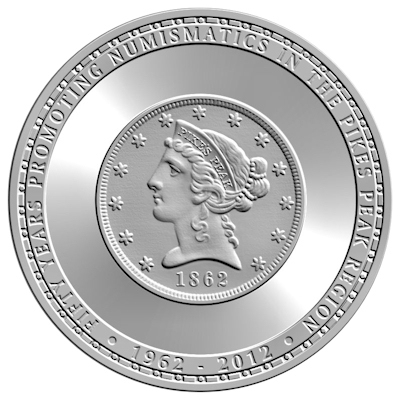 Over the years our membership has included many nationally prominent numismatists among who are Adna G. Wilde Jr., Al C. Overton, Edward C. Rochette, Kenneth E. Bressett, Kenneth L. Hallenbeck, Robert W. Hoge, Steven J. D'Ippolito, Thomas Hallenbeck, William C. Henderson and many others. To celebrate this event the Colorado Springs Coin Club commissioned noted coin designer and medalist Daniel Carr and his Moonlight Mint to design and strike our 50th Anniversary Commemorative Medal. 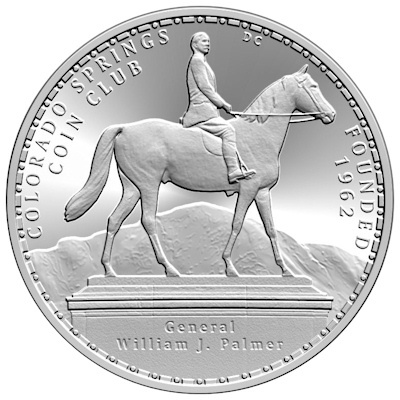 Issued in gold, silver, copper and brass versions, the obverse of our medal features an image of the Palmer statue located in downtown Colorado Springs which depicts the founder of the city, General William Jackson Palmer, astride his horse. Placed in the background is a panoramic view of Pikes Peak. The reverse features the image of a gold coin based on the 1861 Clark, Gruber and Company "Pikes Peak" Liberty Head design bearing the fantasy date of 1862 which is 100 years prior to the founding of our club. The "Pikes Peak" Liberty Head coin is gold plated on the proof finish silver medals.